Sometimes, there is no need for good sushi. *GASP* What??? No, I'm not suddenly regressing to my AYCE days nor have I suddenly changed my mind on Kawawa (went there recently... meh, don't even want to blog about it). 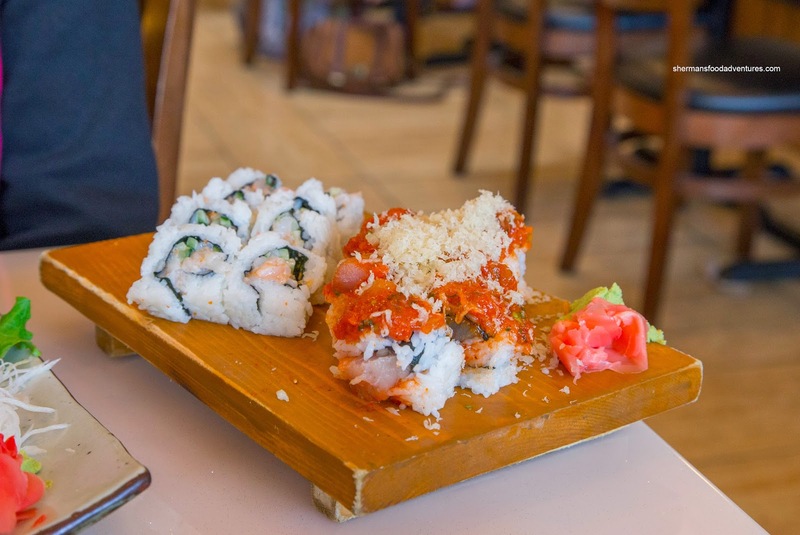 Rather, there are situations where average sushi will do especially since we had the kiddies with us. 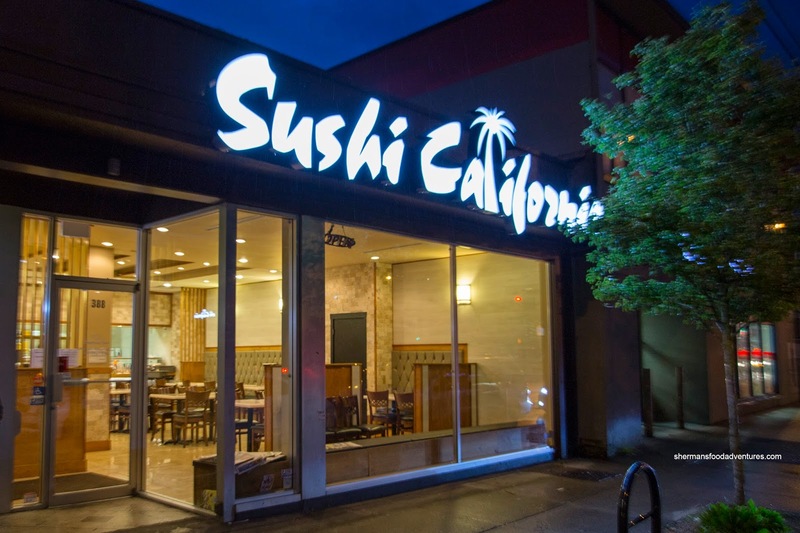 Therefore, we headed over to the new location of Sushi California out on Broadway and Yukon. 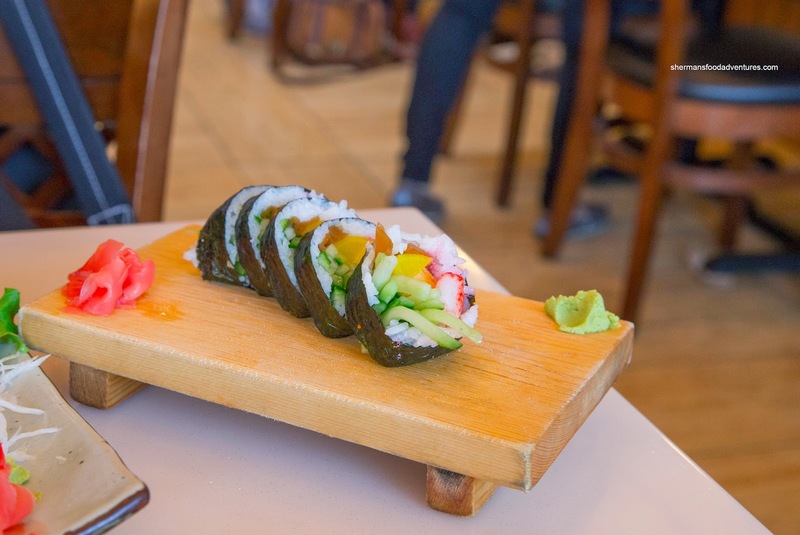 We've been to the original North Road store a few times and it is more or less mediocre sushi on the cheap. Already bustling before 6:00pm, it appeared that many other people were looking for large portions and average quality eats as well. 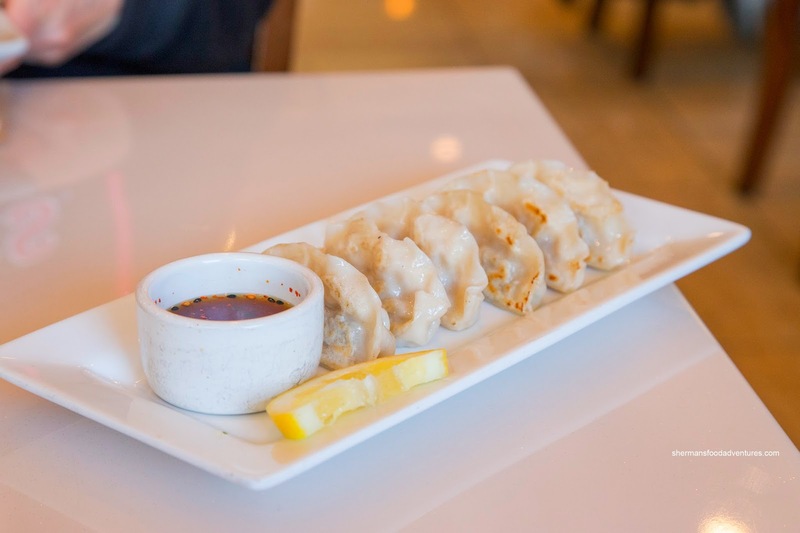 We started with an order of Gyoza and they were pretty sad-looking. With a pasty-white appearance that would make Rose McGowan look tanned, they ate as bad as they looked. The skin was lifeless and chewy while the filling was overly inundated with veggies. Furthermore, they were cold. 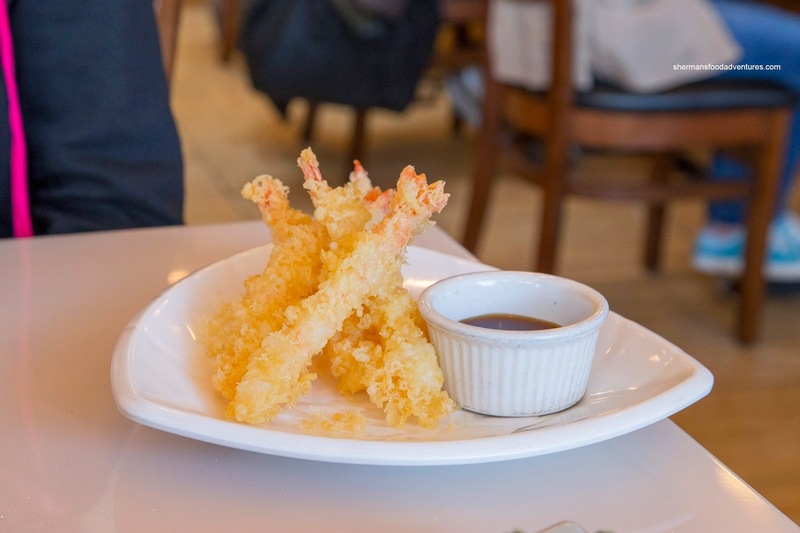 Next up was the Ebi Tempura and thankfully, it was served hot. The batter was decently light and crispy while not overly heavy on the greasy. I liked the ebi inside as it had a buttery snap. 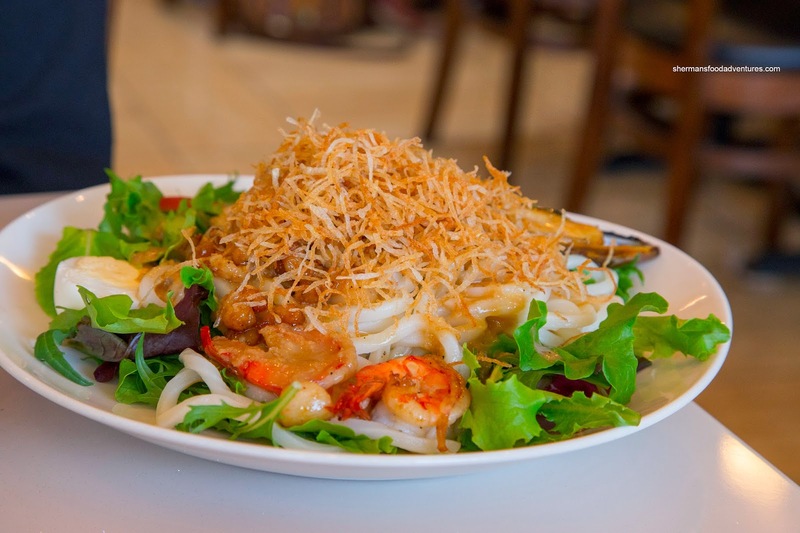 We also had the Seafood Salad which consisted of mesclun greens topped with cold udon, prawns, hokkigai, one mussel, half an egg and baby scallops. It was dressed in a vinaigrette that had a considerable sesame oil kick. 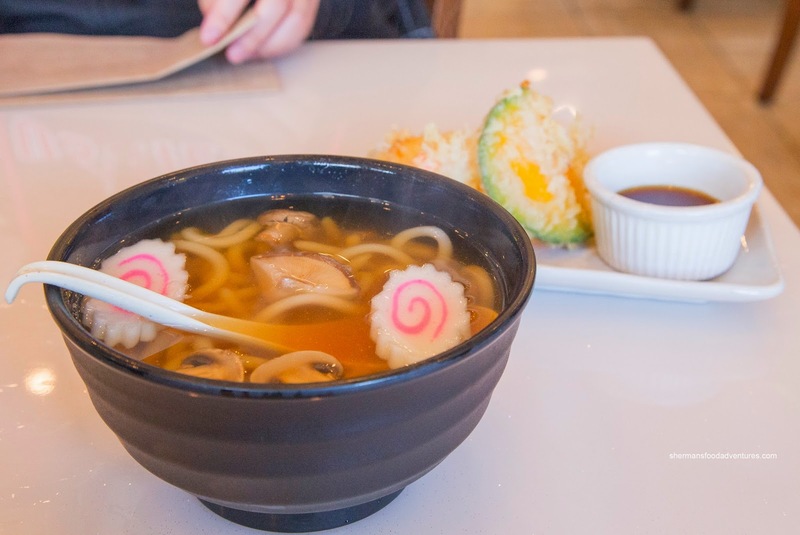 This was actually okay since the moisture was kept to a minimum and the udon was texturally on point being chewy. 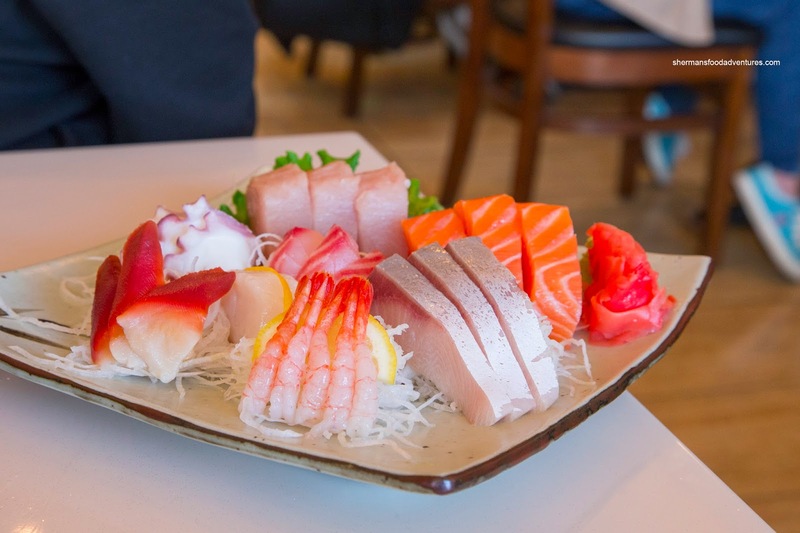 With impressively large slices of tuna and salmon, the Deluxe Assorted Sashimi was more good value than great quality. As I've said before, I like a good deal, but if the tuna is cut the size of a hockey puck, the textures are all wrong. Case in point, would one cut beef carpaccio that thick? Otherwise, the sashimi was okay where it had a healthy sheen. Moving onto the maki sushi, we had the Chopped Scallop Roll and Double Spicy Tuna Roll. My word, that was some of the worst sushi rice we ever had. The texture was softer than rice you would find at a typical Chinese dinner. It was mushy, wet and bland. It made the rolls nasty to eat as the textures and flavours were all wrong. Furthermore, I wasn't a huge fan of the scallops as they were a little too soft. Luckily, the 1/2 Futomaki had much more in the way of ingredients to counteract the crappy rice. Moreover, the crunch from the veggies and oshinko added texture and acidity. Lastly, we ordered the Tempura Udon for the kiddies. As expected, the broth was lacking body, but at the very least, it resembled dashi. Some other places use soy sauce and consider it soup... This was a good portion which featured a side of crispy and hot tempura. As you can probably guess, our meal was not exactly that enjoyable. Remember what I said about good value eats over quality at the beginning? Well, I take it all back if the food resembles anything like we had here.